In the last 24 hours, Montgomery County has received between 1.55 and .5 inches of rain across the county. The Flash Flood Watch has been lifted as the heavier precipitation is expected to move out of our area this evening. Tropical Storm Gordon officially formed today and will be tracking across the Gulf of Mexico over the next couple of days. Currently the path is forecast to impact the Louisiana/Mississippi coast. 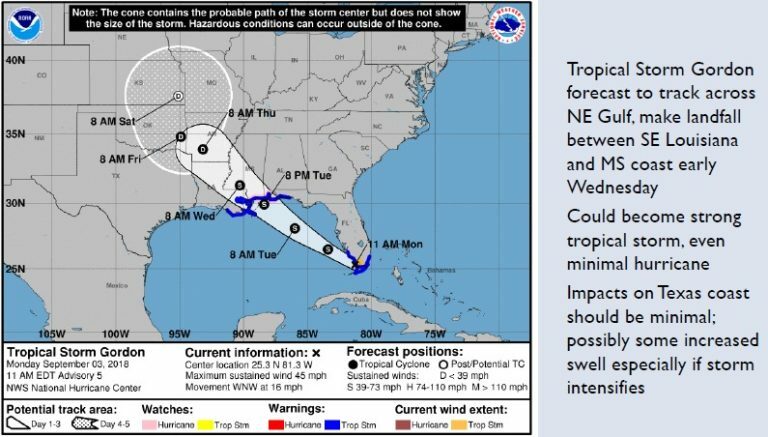 The Montgomery County Office of Homeland Security and Emergency Management will continue to monitor this Gordon over the next few days for any variation in track. This is an excellent reminder that we are in the peak of Hurricane season. Now is the time to prepare and finalize all hurricane preparedness kits and plans. Continue to closely monitor the weather forecast as we move through the next few days. Things can change quickly. For help and information on preparing for disasters, download our new preparedness app ReadyMCTX to your mobile device. Now is the time to prepare. To receive emergency alerts to your phone or email from Montgomery County Office of Emergency Management, register at http://www.mc911.org/page/ecd.AlertMCTX. When you are creating your profile, you must check the box next to Share my Smart911 profile with TX-Montgomery-County-911 to support emergency preparedness. Stay informed and monitor conditions for Montgomery County and the surrounding area on the Office of Homeland Security and Emergency Management website at www.mctxoem.org.